Thank you, we received your registration. Focusing on fundamental components needed across a range of inversions and hand balances, Becoming Balance is designed to help you clean up your technique and gain access to deeper levels of physicality. Students will explore a mix of asana and exercises ranging from mayurasana, to classic crow progressions, headstand, handstand and beyond. Appropriate for beginners, intermediate and advanced students. Any effective movement practice is largely designed around fine-tuning the functionality of the human spine. Back-bends, if performed improperly, are among the leading cause of injuries and personal stagnation within the modern yoga community. However, if performed properly, back-bending and improving overall spinal mobility can bring profound physical, mental, emotional and energetic benefits. Challenge your body and mind with 90 minutes of movement magic led by Sarah “Shakti Bird” Bonsall. Shakti is known for her unique fusion of traditional asana with modern functional movement. Students will explore stimulating transitions, wholistic movement patterns and one-on-one in-class coaching by Rāma throughout the session. This master class is open to and accessible through all levels. Born of a background in functional anatomy and blessed by the good fortune of maturing in an ashram of traditional Hatha Yoga, international yoga instructor, Daniel Rama, is known for bringing a powerful balance of both new and old. With over 2000 hours of formal training in yoga and movement modalities, Shakti is a life-long student of improvement. In her eyes, yoga is not only her way to stimulate and heal both body and mind, but also, a crucial means to her survival. A Vinyasa Flow practice that holds the structure and discipline of Ashtanga and Iyengar Yoga, infused with an immense creativity and dance-like flow.. a fresh and inspired blend of modern vinyasa with classical roots. Practice dynamic asana as a movement mediation in an open system with close attention to physical + energetic alignment, and awareness of complimentary + opposing actions. Also, there is an artful focus on creative transitions that add elegance and uniqueness to the flow of the practice. Throughout the practice, there is a keen observation upon the subtleties of the breath and how it effects the physical + energetic body and mind. Principles of Vinyasa Krama are utilized in a modern way to create an evolutionary practice that aims to awaken, invigorate and harmonize body, mind and spirit. Inversions and Arm Balances are a pure expression of creative energy flowing through the body. Experience fearless flying, pranic body of power, agility and lightness. Float effortlessly by integrating physical + energetic alignment, dynamic movement + bandha, creative core work and intelligent vinyasa krama sequencing. Learn a pathway of creative flows within a powerful Vinyasa workshop so that you can seamlessly integrate handstands, arm-balances, inversions and flying transitions, to energize your practice. Progressively build toward practicing inversions and arm-balances, first at the wall and with partner assists, then move toward practicing in the center of the room with creative energy and empowered vitality. Hands-on assisting is perhaps one of the most important, yet least mastered aspects of teaching Yoga asana. The primary skill one must develop is a keen understanding of the dynamic, inner actions that make each posture come vibrantly to life. Through a combination of demonstration, visual assessment, effective verbal cues, and precise hands-on assists, the teacher can completely redirect the energy of the asana. Learn an approach towards transformational hands-on-assists that is informed by physical / energetic alignment, yet open to the uniqueness of each individual's body. It requires excellent vision, precision, sensitivity, multiple points of awareness and an ego-free approach. A skillful touch has the power to transport your students to a whole new level of awareness. What could take years for a student to understand a particular action or movement, could be done with one precise, effective, supportive assist from a well-trained teacher. Simon and Noelle have honed the craft of hands on assisting through years of study and teaching with master teachers Maty Ezraty, Richard Freeman, Shiva Rea and Dharma Mittra. Backbends are a beautiful balance of grounding + rooting while learning to become fluid + receptive to the awakening currents of breath. Learn alignment principles that are inherent in blueprint backbends such as cobra and upward facing dog. Then, integrate complementary hip + shoulder openers along with energetic keys that will help you advance toward more complex backbends such as Raja-Kapotasana (King Pigeon), Natarajasana (Cosmic Dancer), Vrischikasana (Scorpion) and standing drop-backs. The workshop will take place in the context of a full Vinyasa practice infused with creative sun salutations, standing poses, complimentary core work, twists and inversions. Sometimes students are fearful of backbends because of back-pain. Learn the alignment, dynamic actions and proper preparation that will allow you to experience backbends as exhilarating, energizing and harmonizing. Born and raised in Los Angeles, CA, Calvin Corzine grew up in a community submerged in yoga. An athlete from an early age, sports held center focus. Calvin’s love for sports continues–he’s a die hard Lakers fan who never shies from excitement in the physical world, surfing, and practicing Brazilian Jiu Jitsu. It was in his 20s that Corzine discovered his own draw to the practice of yoga, leading him to his current path as a teacher. Approaches familiar poses in a way that will help you find a sense of strength and focus in your practice. Expect to change your perspective on what is considered “basic” in yoga! This class is broken into 3 parts: the first part with a blindfold (increasing focus and attention to subtle movements), the second with blankets and props, emphasizing strength and boosting focus, and the third taught free of props, honing into increased presence in these yoga postures. Leave this class with expanded insight into your own body and practice. This workshop will explore the use of multiple modalities as well as traditional postures to both open and strengthen the lower half of the body (hips, hamstrings,quads etc.). It explores the use of movement based exercises, yin stretching and unconventional ways to create ongoing opening. Yoga teacher for more than 20 years, musician, teaching to the indians of Amazonia and as well to celebrities, Mika de Brito is a surprising yoga teacher mixing his traveling experiences sans his artistic sensitivity in dynamic and open workshops. Open minded, he likes to share his knowledge on yoga and to learn from others experiments. Dynamic Vinyasa Krama during hour to free tensions and calm down. 15 minutes of Relaxation with Hang Drums and indian singing, to end the Masterclass softly. Doug is a Registered Yoga Teacher with the Yoga Alliance and travels extensively offering workshops, retreats and teacher training courses around the world. Don't miss this opportunity to study with this senior Yoga instructor. Doug's classes are always invigorating and inspirational and his supportive style of teaching and keen sense of humor send his students home with a smile on their face and a softness within their heart. A Vinyasa Flow practice that holds the structure and discipline of Ashtanga and Iyengar Yoga, infused with an immense creativity and dance-like flow.. a fresh and inspired blend of classical and modern styles. Practice dynamic asana as a movement mediation in an open system with close attention to physical / energetic alignment, and awareness of complimentary / opposing actions. Also, there is an artful focus on creative transitions that add elegance and uniqueness to the flow of the practice. Finally, an observation upon the subtleties of the breath and how feeling of how it affects the body and mind. Principles of Vinyasa Krama are utilized to create an evolutionary practice that aims to challenge, invigorate and harmonize body, mind and soul. This sequence will take you on a journey of moving meditation and is an opportunity to develop your practice with an intensive focus on the body, mind and soul with a Hatha Flow practice. Olivia will share how to explore basic to intermediate poses with awareness and consciousness and to create effortless transitions. This class will also include pranayama and guided meditation. Summer, sun and good mood. The beautiful days are here. We invite you to a Giant picnic at the Savonnière beach. Your family and friends are welcome. Bring your picnic, blanket, games, musical instruments and your smile. It will be a nice way to have fun and to feast your taste buds in a friendly and positive atmosphere. Enjoy a long weekend to immerse in the idyllic setting of the Domaine du Taillé. Come take care of yourself, slow down the pace of the body, the mind and explore your full energy potential. On the agenda: Hatha Raja Yoga with Olivia and Yiannis, Yoga Nidra, Organic Vegetarian Food and Sharings. Olivia embodies sweetness and femininity. She will guide you with love, playfulness, humility, patience, humor, non-violence and understanding to help each person achieve harmony between body and mind. By sharing her passion, Olivia wants to generate well-being, joy and sincerity for the benefit of all. Practices with Olivia will be taught in French. Yiannis embodies the deep inner strength and playful nature of his teacher, Dharma Mittra, and strives to be a living example of the true essence of yoga. Inspired and impressed by the way yoga has transformed his life, Yiannis teaches so that everyone around him can also experience the many benefits of yoga. Practices with Yiannis will be taught in English. The Domaine du Taillé is a welcome center in the heart of a 100-hectare park in southern Ardèche. An Amazing place to rest, heal, purify and an of course to practice and deepen our knowledge of Yoga. Reservation directly to Domaine du Taillé for accommodation. Possibility of individual rooms, tipis, eco-chic tents, yurts or chalets. Remember to bring your bath towel, yoga mat, bricks, zafu, blanket, according to your needs. 18:00 - 19:15 Opening of the retreat with a gentle practice in company of Olivia. 21:15 - 22:00 Yoga Nidra with Yiannis. This session will help to release all tensions and to connect with your inner self. This course will be shared in English. 09:00 - 12:00 Hatha Raja Yoga with Yiannis. An intense practice that will combine: mantras, pranayama (breathing techniques), asanas, yoga nidra and meditation techniques. Yiannis will share this practice as he has received from his master Sri Dharma Mittra. This course will be taught in English. 16:30 - 18:45 Hatha Raja Flow with Olivia. A feminine practice, fluid, evolutive, passionate, sprinkled with a creative vinyasa. Olivia will share this practice as she has received it from her master Sri Andrei Ram. The rest of the day is free allowing you to enjoy the beautiful surrounding forest or to swim in the natural pools treated ecologically. Yiannis will share this practice as he has received from his master Sri Dharma Mittra. This course will be in English. 14:30 - 15:30 Closing ceremony, gentle practice with Olivia. Location: Domaine du Taillé - Vesseaux, Ardèche. Backbending postures are an invaluable aid in maintaining full mobility and flexibility of the spine, shoulders, chest and back. They restore youthfulness to the body helping one feel young. In this workshop, Yiannis will share the fundamental tools needed to practice backbending with precision and confidence. He will also introduce a purifying Pranayama sequence. These breathing exercises will open the respiratory system and strengthen the nerves, leading to greater control of the senses and calmer and clearer mind. Like an asana practice, Pranayama purifies the physical and subtle body of toxic impurities. To conclude, Yiannis will introduce Meditation, visualisation and concentration techniques, as well as Yoga Nidra. This deep healing relaxation can dispel tension and fatigue in the physical body; relieve depression, anxiety, craving; rejuvenate and energize all systems – physical and subtle. This bolsters the human’s natural healing capacity, leading to rejuvenation on physical, energetic, emotional, mental and spiritual level. Explore Inversions with Yiannis and increase the health and strength of your spine. These postures bring pure oxygenated blood to the brain, heart pituitary and thyroid glands. They stimulate the spine, the chakras and strengthen the shoulders, arms and wrists. Inversions bring balance and stability to the body and increase mental power and clarity, sharpness and confidence. This workshop will also include ancient pranayama (breathing) techniques, concentration and visualization techniques as well as powerful mantras. This class culminates in a final meditation to manifest your soul’s longings into the world. A complete practice that combines mantras, pranayama (breathing techniques), asanas, yoga nidra and meditation techniques. Yiannis will share this practice as he has received from his master sri Dharma Mittra. Yiannis has been studying and teaching Hatha-Raja Yoga for over 12 years, having found his guru in Sri Dharma Mittra in 2003. he is deeply focused on the goal of self realization as passed down directly from Sri Dharma Mittra. Yiannis practice is appropriate for all levels of practitioners, as various options and variations of each pose are always offered. Yiannis embodies the deep inner strength and playful nature of his teacher, Dharma Mittra and striving to be a living example of the true essence of yoga. Inspired and awed by the way that yoga has transformed his life, Yiannis teaches so others may also experience the many amazing benefits of yoga to the body, mind and soul. He is an avid student of Bhakti yoga, Karma yoga, Sanskrit, meditation and pranayama (sacred breathing practices). Come and celebrate our second anniversary on Saturday 10 March. We will mark this special event with a practice of Hatha Raja Flow. This course will take you on a journey of moving meditation and into the depths of your being to discover the freedom and happiness that is your essential nature. After this practice, we will share a friendly moment around a tea and a snack. It is thanks to you that we are here. Let's continue to build this beautiful community together! Thank you for confirming your presence. Limited number of places. Yoga Massage is a therapeutic, holistic bodywork, with roots in the tradition of Yoga. In this workshop you will learn, practice and receive a balanced sequence of Yoga Massage, which you'll be able to share with your family and friends in order to promote relaxation and well-being. You will learn essential techniques to prepare yourself physically and mentally to give a massage so that the act of giving massage becomes a Yoga in itself. Each sequence will be explained and demonstrated, and then practiced in pairs, so that each one will have the opportunity to give and receive. An illustrated manual will be given to each participant. We will pay special attention to our breath and posture, while cultivating an attitude of compassion and kindness (Karuṇā / Maitrī). After a diploma in engineering and a career as a professional rock-climber, Lise turned to India when she was to spend the next 10 years of her life under guidance of Masters in Yoga, Ayurveda and Kalari (martial and medical art of Kerala). Since 2007 she has been practicing and teaching the skills that she received during these years of apprenticeship. A Vinyasa Flow practice that is a blend of classical and modern styles. Practice dynamic asana as a movement meditation in an open system that guides the student to feel the Yoga practice as an unscripted adventure. There is a focus on the inner workings of the breath on the body and mind; artful and creative transitions that add elegance to the flow of the practice. Alignment is detailed and energetic, yet adaptive for the individual practitioner. 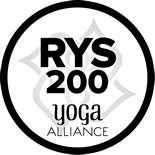 The principles of Vinyasa Krama are used to create an evolutionary practice that is appropriate for students of all levels. Inversions and Arm Balances are pure expression of creative energy flowing through the body. Experience fearless flying, pranic body of power, agility and lightness. Float effortlessly by integrating physical + energetic alignment, dynamic movement with bandha and intelligent Krama sequencing. Learn a pathway of flows within a powerful Vinyasa workshop so that you can evolve to enjoying handstands, inversions and flying transitions in the center of the room with creative energy and empowered vitality. This workshop is for all levels from adventurous beginners to handstand monkeys! Learn the approach towards transformation hands-on-assists with physical and energetic alignment. Assisting is a very important element of teaching; a great compliment to good verbal cues. It requires vision, precision, sensitivity, multiple points of awareness and an ego-free approach. A skillful touch as the power to transport your students to a whole new level of awareness. What could take years for a student to understand a particular action or movement, could be done with one precise, effective, supportive assist from a well-trained teacher. Enjoy a slowly developing, flowing sequence of postures that are fluidly powerful and energetically alive; a movement meditation for mental focus and overall lightness. Create space in the joints and spine, calm the nervous system and balance your energy. The asana flow is similar to the way tai-chi is practiced; slow, methodical and meditative. The practice seamlessly integrates fluid namaskars, deep hip-openers, restorative twisting, backbending and calming forward bends. Experience an evolution toward blissful relaxation, pranayama and meditation. “Yoga Chitta Vritti Nirodhah” One common interpretation is “yoga is the cessation of the fluctuations of the mind." In other words, Yoga is done in order to achieve stillness and clarity of mind. This course is designed to take you on a journey into the depths of your being to discover the freedom and happiness that is your essential nature. This will be an opportunity to develop your practice with an intensive focus on the body, mind and soul with a traditional Hatha Raja Yoga practice as passed on by Sri Andrei Ram sprinkled with creative vinyasa. We will learn to pay attention to what is, as it is with an attitude of kindness. Olivia will share how to explore basic to intermediate poses with awareness and consciousness and to create effortless transitions appropriate for students of all levels. You will explore a little bit of everything : backbends, deep twists, deep hip openers and of course inversions. This course will include breathwork, kriya yoga techniques and guided meditation.The focus on this course will be letting go and flow. Connecting mind and body with joy and calm. Losing yourself, finding yourself, accepting where you are in the present moment and getting to know yourself better. Agustin has been studying and teaching Hatha Raja Yoga for over 13 years. He is deeply focused on self-realization as transmitted by his Guru, Sri Dharma Mittra. 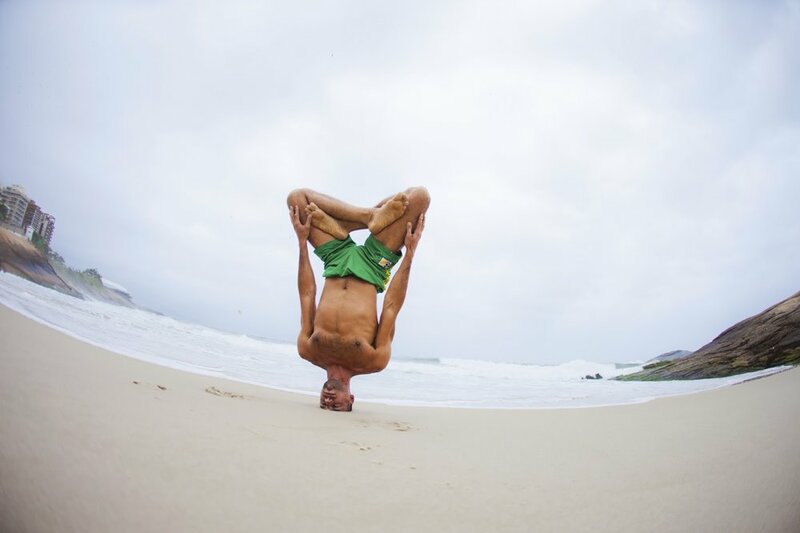 Agustin's teaching is appropriate for all levels, from adventurous beginners to experienced yogis. Augustin embodies the deep inner strength and playful nature of his teacher, Sri Dharma Mittra. Inspired and impressed by the way yoga has transformed his life. Agustin teaches so that everyone around him can also experience the many benefits of yoga. He is also an avid student of Hatha Yoga, Ashtanga Yoga, AcroYoga, Thai Massage, Meditation and Pranayama (Sacred Breathing Practices). The hips, sacred space of our deep emotions, will be explored in detail through many postures, and breathing techniques. This workshop aims to open the hips and create space in this region, to release negative emotions, to let go, to regain a light step, and the joy of living. Mai has been a full time devoted Yoga practitioner since 2006. She shares with Olivia the lineage of Sri Dharma Mittra by the kindness of beloved Master Andrei Ram Om. Her classes are adapted to all levels of practice, be prepared to move the body and the mind following the consciousness of the breath, from challenging and fun action towards a state of peace and calm. Through this workshop open to all, yogis apprentices as well as confirmed yogis will explore each day a different Chakra. We will harmonize each energy center by visualization, sound and breathing techniques in order to free ourselves from our tensions, we will explore postures related to different chakras with movement and immobility, inhalation and exhalation, resistance and letting by observing sensations and the mechanisms of the body and the breath. Come and listen to your body, to its rhythm. P.s: take your mat and cover yourself for savasana. In case of bad weather, the courses will be canceled. To be followed from week to week on the Facebook page of So Ham Yoga Studio. We invite you to participate at this collective and unique experience of Yoga - Thousands of people in the same movement, the same breath, at the same time and at the same rate. All carried by the same vibration. FOR PRACTITIONERS OF ALL LEVELS. Andrei Ram Om maintains the tradition of living the life of a Yogi, while living in the ordinary world. He has been ordained by Sri Dharma Mittra to continue passing the living Yoga practices and to share them with others worldwide. This session includes at least 90 minutes of vinyasa-asana practice, yoga nidra (psychic sleep) and Psychic Development Meditation. This meditation method promotes positive mental patterns to empower one’s thoughts by stimulating the pituitary and pineal glands in the base of the brain, enhancing mental sharpness and intuition. FOR PRACTITIONERS OF ALL LEVELS. TAUGHT IN ENGLISH. LIMITED CAPACITY.